The 1986 horror movie House is at once an anomaly in the genre and the kind of byproduct only the '80s could have produced. It is low-budget but never schlocky, tremendous fun but rarely outright silly. It's a movie of great imagination but with enough of a grounded emotional center to not be totally ephemeral. It gave Fred Dekker his start and demonstrated that producer Sean S. Cunningham and director Steve Miner could collaborate on a project outside of Crystal Lake and find some success. It is a mix of horror and comedy, loaded with practical effects and cast with actors best known at the time for TV shows. It seems like a movie that probably shouldn't work, but Arrow's new Blu-ray confirms that it's a special example of the decade that produced a lot of special movies. William Katt plays Roger Cobb, celebrated horror author now divorced from his wife (Kay Lenz) after their young son vanished. Roger moves into the house of his aunt who recently hung herself after being driven mad by what she says was the house playing tricks on her. As Roger settles in to write a new book -- this one a personal account of his experiences in the Vietnam War -- the house begins to play tricks on him, too. Strange things happen. Monsters appear. And then things get worse. I've always been a fan of House -- it's one of those horror movies I saw probably too young because there's nothing too scary or objectionable in it despite the R rating -- but revisiting it on the new Blu-ray reminded me just how much fun it really is. It has its limitations, be they a couple of on-the-nose needle drops (the closest the movie ever gets to being explicitly jokey) or the cheapest-looking Vietnam sequences ever put to film, but that stuff is greatly overshadowed by giant monsters that pop out of the closet or a really good jump scare when Roger's ex is replaced by a hideous hag or George Wendt's really funny performance as a new neighbor. Steve Miner is not a director known for possessing a deft comic touch (Exhibit A: Soul Man, Exhibit B: My Father the Hero), but in House strikes quite a nice balance between humor and horror. William Katt sells the material the same way he sold The Greatest American Hero: he plays it straight but recognizes that it's all rather fantastic and not to be taken too seriously. At the same time, the emotional core of Roger's sense of loss over his son and his guilt over something that happened in the war keep House from being 90 minutes of madcap silliness -- the movie is lightweight but not inconsequential. I've spoken a lot in the past about a certain kind of horror movie that's specific to the 1980s, still my favorite decade for horror. That's due in large part to movies like House, which combines humor, heart and horror and is allowed to go in whatever crazy directions it wants. It's a movie that's allowed to have a ton of personality and showcases the work of some talented magicians creating the effects. 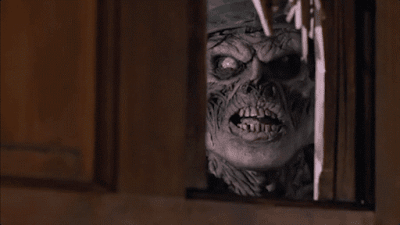 It's far from the best the decade has to offer, but if someone wanted to understand what made the '80s so great for horror I would probably show them House. Less successful is the sequel, House II: The Second Story, released just one year later. Ethan Wiley, screenwriter of the original film (adapting a story by his college friend Fred Dekker), takes over as director for the follow-up, which takes place in a brand new house with a brand new set of characters. 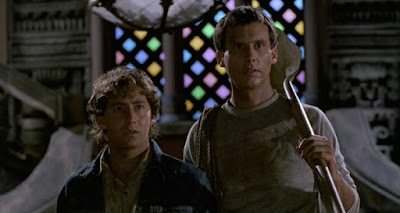 This time it's Ayre Gross and wisecracking best friend Jonathan Stark searching for a crystal skull they believe to be buried in the house that has been in Gross' family for generations. They find it, along with Gross' great, great grandfather (Royal Dano under heavy prosthetics), who has come back to life and tells the boys they must protect the skull against the evil forces who would steal it. Before you know it, the skull is snatched by a dinosaur bird as the house opens up into multiple dimensions, each with its own set of monsters and obstacles to be faced -- none more dangerous than Slim Reeser, another zombie cowboy who will stop at nothing to possess the skull. It's been as many years since I last saw House II as it has since I last saw House, but it's not as pleasant a surprise. I wanted to rediscover a gem, honest I did, especially because my friend Heather Wixson is such a fan of the sequel and arguably the internet's foremost expert on the movie. I admire what Wiley and his special effects team are able to accomplish on just a $3 million budget, as this is a movie loaded with creatures and stop-motion animation and different worlds being created on the cheap. It has even more imagination than the first film. The difference is in the aesthetic. 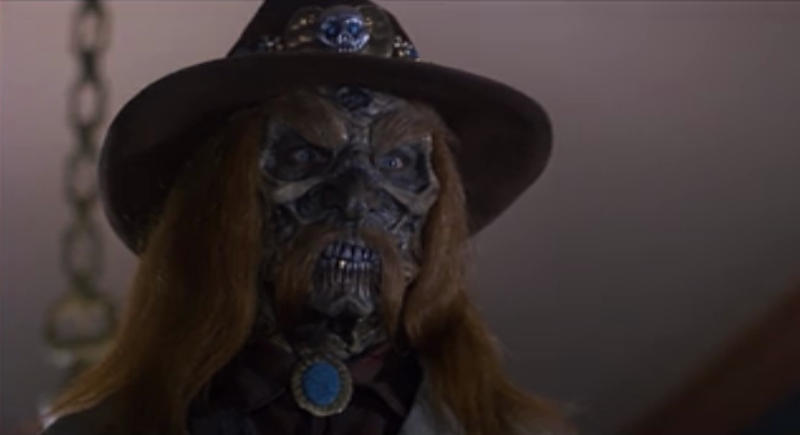 Between the Old West stuff and the prehistoric stuff and the Aztec stuff and a slimy-slash-adorable caterpillar dog, there's a lot going on in House II, but very little connects with me the way stuff does in the Steve Miner film. That's a movie about monsters that are more E.C. Comics than outright scary, but that's the kind of stuff I eat up. Despite the vast number of different sets and creatures found in The Second Story, very little of it manages to capture my imagination save for Slim and his skeleton horse. It's just a matter of personal preference, I know, but I can only appreciate the wildness of House II. I have a much harder time enjoying it. House II also leans much more heavily on the comedy side of the "horror comedy" equation, all but abandoning the former in favor of the latter. This is a softer movie, not just because it's more nakedly sentimental in terms of the relationship between Ayre Gross and Gramps, but also in the PG-13 rating and a reimagining of what the house now represents. Here it's more about adventure (there's even a scene in which John Ratzenberger shows up as an electrician and turns out to be a swashbuckling adventurer who's good with a sword, because I guess the joke this time is that there's a different actor from Cheers in the cast) than it is about the house presenting scares. I appreciate that Wiley takes a new approach for the sequel, as I'm sure it would have been very easy to repeat exactly what the first movie did but in a new house (or, even worse, in the same house). But just because I admire his ambition does not mean I connect with the end results. Two House Blu-ray collections are hitting the market at the same time. 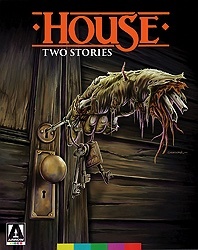 In the UK, there's a box collecting all four installments in the franchise (yes, including House III, released in the U.S. as The Horror Show); here in the United States, we get just the first two films in a handsome box called House: Two Stories. Both movies get new 2K restorations that make them look better than they ever have outside of their original theatrical exhibition, which would be reason enough to buy the box for fans of the series. But of course there's more to it than that. Each film gets a new hour-long retrospective documentary collecting most of the major participants in each movie, as well as archival making-of featurettes, still galleries, trailer galleries and commentary tracks. The commentary for House includes William Katt, Steve Miner, Sean Cunningham and screenwriter Ethan Wiley; the commentary for House II includes Wiley and producer Sean Cunningham. The two films also come packaged with a really nice book containing writing on the series. I don't know that House should have ever spawned a franchise; the sequels have nothing to do with the original except for the fact that there is a house, which could be said of most other movies as well. At the same time, watching other filmmakers attempt to reproduce the alchemy of the original House is interesting, even if it is just House II and most of the people trying to reproduce the first movie were around its production. I'm really glad that Arrow is releasing both House and House II as a single package (I already have Scream Factory's release of The Horror Show and have no real use for House IV, so the first two are all I need...OCD be damned). While House is the one I'm going to revisit several times in the future and I'm doubtful I would ever buy House II if it was released separately, including both movies together makes for a cool education in '80s horror. I like watching as Cunningham tries to turn this into a franchise, I like watching Ethan Wiley move from writer to director and trying to change things up, and I like watching a pair of low-budget '80s horror movies that push the limits of what their resources will allow and pack their stories with really fun effects. That hardly happens anymore, and certainly not in the same way. Waiting for my copy with all four movies to come in from the UK. I've only seen the first, so I'm excited. Cool article! But I'm confused. I could swore I remembered you talking about how much you thought House was garbage on the podcast. Did you turn around on it? Or am I crazy? I have no memory of ever not liking it. Maybe I misspoke? I can't recall trashing it, but you guys often have better memories than me. I can recall you wanting to revisit the House films, but I don't remember you ever really trashing them. I must have heard wrong! My bad. I remember being confused because it seemed to me like the kind of movie you would like. Glad that's cleared up! House is fun! Getting this release along with the Phantasm box set last month made for an epic week of viewing. On a side note- this Halloween would be a great time to do the Phantasm franchise! That would be great. I still want to hear Hellraiser or Children of the Corn someday, both would be torture, but it could be really funny to listen them get ripped to shreds. Fun fact- Children of the Corn 4 "takes place" in my hometown of Grand Island, Nebraska. That doesn't make me like it. I just think it's funny watching the filmmakers approximate my hometown. Meth wasn't depicted to the degree that would be accurate. I would love a Hellraiser franchise podcast as well, especially with the Scarlet Box hitting the US last year. If we're talking about the series cast in October I think doing the Horror movies of Stuart Gordon would be fun. Not a linear series obviously but definitely a distinctive style with plenty of parallels. Also I saw house around the same time I saw Dead Alive, and even though Dead Alive won that battle I still really enjoy House's 'let's have fun imagining!' spirit. Also I could relate to it, having grown up in a house. I have to admit, I too have always had a fondness for the House films. They are perfect sleepover movie material...plus, I have always kinda liked William Katt. I also had the honor of speaking to composer Harry Manfredini about the scores for some of these films, for my book Scored to Death [plug ;-)]. Harry is a fascinating guy and I have always thought that the use of music in horror/comedies is a potentially tricky thing. Harry's insight into the subgenre is really interesting. It is a great time to be a horror fan.